Figment is a colorful, whimsical puzzle game that combines childlike fantasies with mature themes including death, disease and trauma. It shouldn't work. These ideas should be oil and water, existing around each other but never fully melding into a cohesive experience. But Figment defies logic -- even in an early build, the game is magical and deep at the same time. 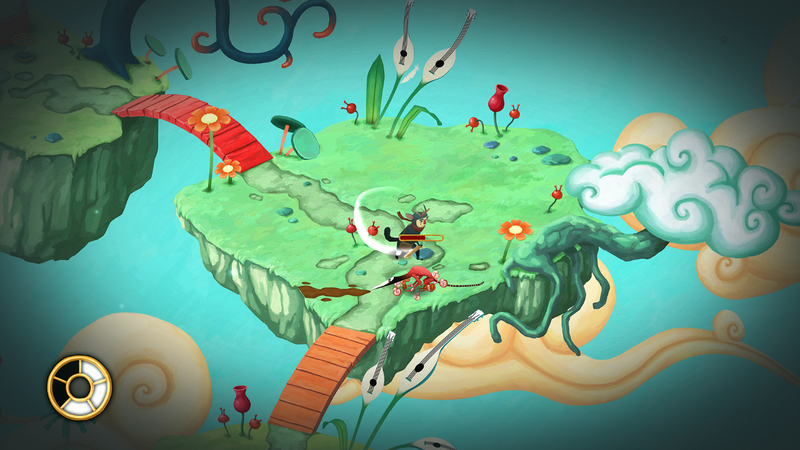 It's like an episode of Adventure Time mixed with the adorable puzzler Machinarium but in a musical, hand-painted world. The game takes place inside someone's head, in a subconscious filled with lush grass platforms, fluffy clouds, red-roofed huts... and fear. In Figment, fear takes the form of creepy creatures that have infiltrated this mind and are hell-bent on destroying its beauty. The fear of disease, for example, is a cackling, coughing beast with lanky limbs, a thin tail, at least one long row of pointy teeth and a red plague mask. His name is The Plague, after all. He taunts the protagonist -- a Teletubby-like creature with a cute red nose and tiny antlers -- in rhymes as he throws gas bombs across the grass. Figment is part puzzler and part action game, due to hit PC, Mac, Xbox One and PlayStation 4 in early 2017. Players explore the land masses of different worlds, solving spatial riddles and battling fear minions with a wooden sword. You're able to quickly roll out of the way of incoming attacks, strike back and collect important tools scattered around the environments. The game heavily incorporates music, too -- many of its puzzles are related to instruments or sounds, and the landscape is packed with stylized flutes, tubas, trumpets, accordions and more. It looks like the kind of game Dr. Seuss would have made. While frolicking around the quirky world that The Plague has invaded, you fight off his beasties and put together contraptions that will help your adorable warrior advance to the next trouble spot, the next infestation of fear. This is where the puzzle aspect comes in: As in games like Machinarium, the riddles revolve around observation and creative thinking. If you can't turn on one of the windmills, maybe it's because you need the wheel part that was back by the lighthouse. There's a huge gap between this island and the next -- perhaps you can figure out a way to knock the giant flute out of the tree and use it as a bridge. Some of the puzzles are obvious, but Figment sets itself up for complex head-scratchers as the game progresses. The creators at the Danish studio Bedtime Digital Games call Figment "dreampunk," and it's an aesthetic they have plenty of experience with. Their debut game, Back to Bed, is an eccentric dreamscape that they created as students back in 2013. It's an M.C. Escher-inspired puzzle platformer, and it thrust Bedtime into the spotlight after becoming an IGF 2013 Student Showcase Finalist and collecting a few other awards. Figment represents the natural evolution of Bedtime's design philosophy. The team, led by Klaus Pedersen and Jonas Byrresen, know how to craft dense puzzles in beautiful, moody worlds. They aren't afraid to get a little morbid -- one of the areas in Figment is pockmarked with giant molars, in reference to the common dream where your teeth suddenly fall out, supposedly signaling stress about aging and death. Still, the world remains beautiful to look at, play in and listen to, making Figment ideal for anyone, at any age, with any fear.